The fabulous Heartbeats is a 50s -60s rock n’ roll show band that specializes in delivering the nostalgic music of the 1950′s and 1960′s capturing the mood and everyone’s favourite ‘golden oldies’ of yesteryear. If artists such as the Everly Brothers, Dion and the Belmonts, Buddy Holly, Ricky Nelson, the Beatles, Rolling Stones, Beach Boys, Chuck Berry, Danny and the Juniors, Bobby Vee, the Temptations, Elvis Presley, Del Shannon, Roy Orbison and many more, strike a warm and memorable chord with you then give us a call. 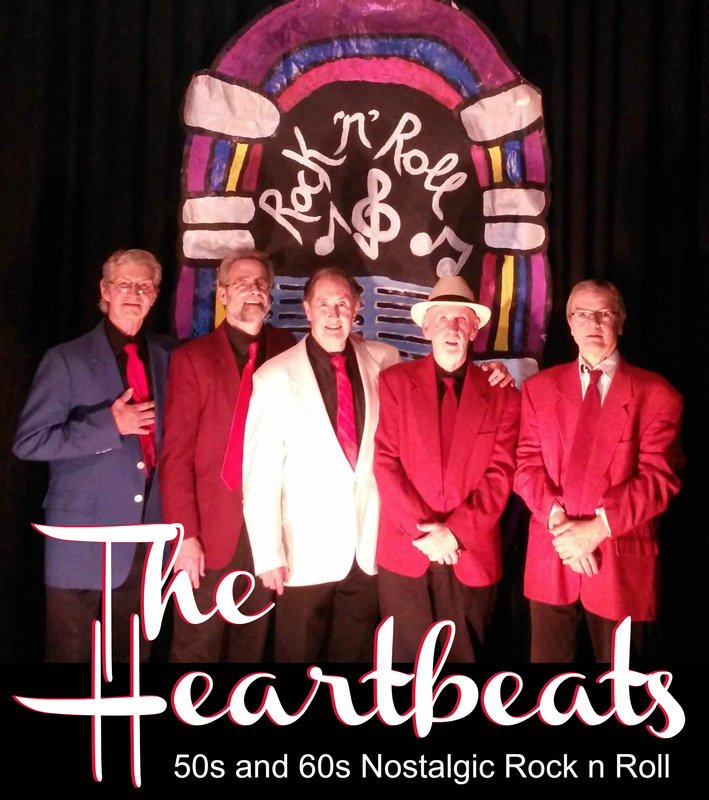 We know the Heartbeats can promise a musical evening that is fun, upbeat and most of all dance able. Enjoy their showmanship as they typically do 4 costume changes to go along with the era and genre of 50's & 60's songs and artists. Also included, a special “tribute set” to several artists who have gone on to ‘rock and roll heaven’. Whether you are planning a fundraiser, community dance, fair/festival, company appreciation night, wedding reception, Valentine’s sweetheart dance or just an old fashioned ‘sock-hop’ party for any occasion, Heartbeats are an all pro show band. Buddy to the Beatles – a Rock n’ Roll Revue 1954-1964”. This show employs a dynamic lighting, costume changes, narration and background slide presentation to trace the history of rock and roll from its early roots in 1954 (Bill Haley and his Comets) through to the tragic plane crash that took Buddy Holly, the Big Bopper and Ritchie Valens (55 years) to the British Invasion and the appearance of the Beatles on the Ed Sullivan Show Feb 9, 1964.. Suited for sit down corporate type events. Ottawa Talent Agency is proud to represent this seasoned group of entertainers and look forward to bringing you the very best of the 50's and 60's for your next event.